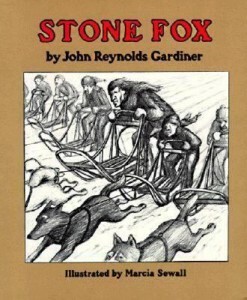 Chipette finished reading Stone Fox last week. She liked the book, but at the end, as she was reading to me, she stopped and said, "Mom, this book is making my eyes get a little wet." I told her that some of the best books to read are the ones that can make you feel emotions so deeply that you can't help but laugh outloud (The Best Christmas Pagent Ever), cry (Little Women), or get so scared that you can only read the book during the daytime (any Dean Koontz novel). This week we had been going over some review questions of the book. Our last activity was for her to write an epilogue to the book. I explained to her what an epilogue was and then she brainstormed for ideas of what happened to Little Willy, Grandfather, and Stone Fox after the book ended. While all of the ideas are her own, I did help with some of the spelling and wording; we worked on being concise, not using four words, when one would do (Thank you, Dr Philpotts from Advanced Composition in college!). Just love it! :) Sharing books with my children is one of my favorite aspects of parenting.